In the lovely Charleston colours of maroon over black with light grey fabric seats. Restored by 2CV City, this pretty 1983 Charleston was purchased from them by a customer of ours in the West Country five years ago. It has the all important galvanised chassis fitted and the bodywork is in excellent, rustfree condition as is the underside. The interior is unmarked, including the seats which can deteriorate, and the roof is as new. 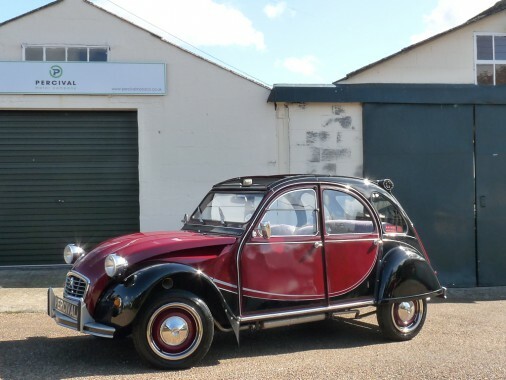 The Citroen has been maintained to within an inch of its life and in the last year has had a reconditioned engine fitted, a new carburettor, new Michelin tyres alll round, a full exhaust system and new rear shock absorbers. Electronic ignition is fitted and the 2CV runs beautifully.